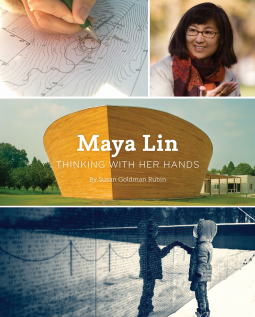 Fittingly, Susan Goldman Rubin titles the chapters of her book Maya Lin with artful substances from nature since the natural world informs Maya's architectural art. Chapter 1 – Clay describes Maya’s early years in a home of Chinese ancestry with a father who is a ceramicist and a mother who is a poet. Given the chance to do her own modeling with the clay, hearing poetic words, and being surrounded by natural beauty sets a stage early for what she will become. Chapter 2 – Granite tells the story of her unexpected win by a college student over 1,421 entries to design the Vietnam Memorial. Who would have thought her simple symbolic design would require so much strength on her part to keep that design as she had envisioned or that she would get only a B + for the class? Chapter 3 – Water gave her a vision of using the biblical quote from the Martin Luther King address on the Civil Rights Memorial “Until Justice rolls down like water and righteousness like a mighty stream” with water flowing over the quote. Chapter 4 – Earth took her back to childhood playing with her brother over hills behind their house. She created “Wave Field,” “Flutter,” and “Storm King Wave Field” from that memory experience. Chapter 5 – Glass kept an old barn in one sculpture and created a skylighted Noah’s ark with another, both with abundant glass to give a feeling of being outdoors in nature. Chapter 6 – Celadon green from her Chinese heritage was Maya’s choice for the basic color of the Museum of Chinese in America. Chapter 7 – Dunes and Driftwood became replacements for parking lots as she paid tribute to the paths of Lewis and Clark and the parallel path of the Native Americans to the ocean. She achieved her goal of showing what had been lost and what could be saved. Chapter 8 – Wood has her only design for a family home. Most of the time, Maya will not do this kind of work. However, she did not abandon her outdoor approach since the house has a tree growing up through the deck and an abundance of windows. The final chapter sets her philosophy of giving back and thinking about what is missing as society takes over the natural world. With many beautiful photographs, abundant research, and a gift for story-telling, Susan Goldman Rubin shows Maya, the human being, along with her artistic achievement and her love of nature. I recommend this fascinating biography of the work of the accomplished architect which is also a Junior Library Guild selection if you would like additional verification.